Just like red wine and classical music, blogging attracts a more mature audience, while the younger set prefers to share their lives via social networks. That's according to a survey recently released by the Pew Research Center's Internet and American Life Project entitled Social Media and Young Adults, which continues the PIAP's obsession with tracking the digital habits of the so-called Millennial generation, defined in the study as young adults between the ages of 18 and 29. The survey found that blogging has dropped by nine percent among Millennials in the last two years from 24 percent in December 2007 to 15 percent by 2009. During that same period, however, blogging won over more online adults aged thirty and over with a four point rise from 7 to 11 percent. 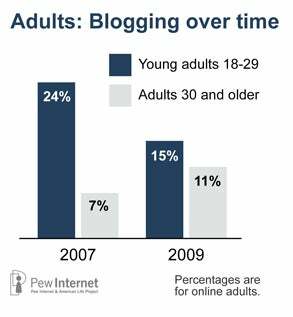 It's not just the Millennials that are kicking blogging to the curb either; the teenage blogging population has been cut in half from 28 percent in 2006 to 14 percent in 2006. 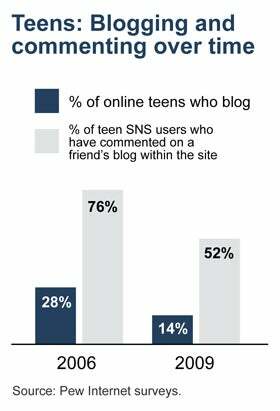 Instead of blogging, kids these days are signing up in droves for social networking sites (SNS) like Facebook and MySpace. The PIAP survey says 73 percent of Internet-loving teens are now using social networking Websites (SNS), which is a significant uptick from previous studies. In 2006, 55 percent were using SNS and by February 2008 that number had grown to 65 percent. While Millennials and older adults may differ on the importance of blogging in their digital lives, both groups favor Facebook as their SNS of choice. Seventy-one percent of young adults use Facebook, as do 75 percent of those thirty and over. Sixty-six percent of younger teens, on the other hand, prefer News Corp's MySpace. 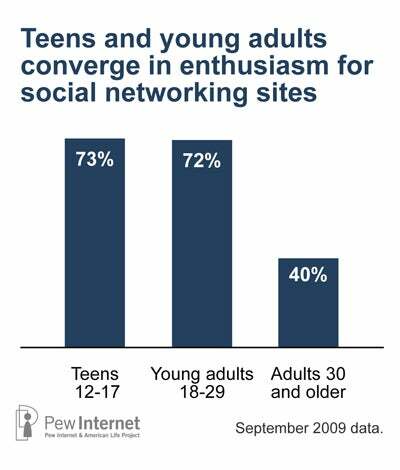 The PIAP survey also found that younger people aged 12-17 are less likely to use Twitter than Millennials and adults. 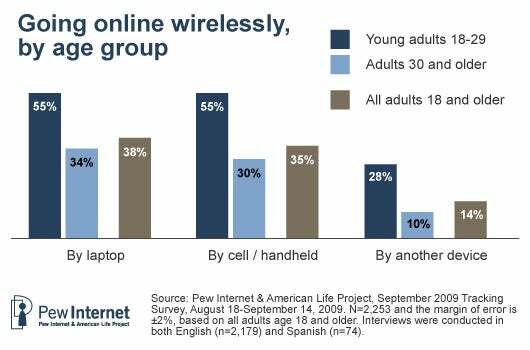 The older you are the less likely you are to be using Wi-Fi or your cell phone to get online. The Pew survey found that just 34 percent of those aged 50 and over use a wireless Internet connection, 63 percent of 30-49 year olds go wireless and the Millennials are all about over-the-air online access with 81 percent of them favoring wireless Internet access. Milennials are also the only age group the Pew survey found where the majority favor mobile computers: 66 percent of young adults own a laptop or netbook, while 53 percent have a desktop PC. Interestingly, the PIAP study found that African American adults are the most active and fast-growing segment of the population using the mobile Web. But the younger generations are more likely to own a cell phone, with 73 percent of younger teens owning a cell phone and mobile device ownership among Millennials hits 93 percent. And yet, the fastest rising age group for cell phone ownership may be twelve-year-old children. The Pew survey found that 58 percent of 12-year olds now have a cell phone, compared to just 18 percent in 2004. Other findings from the survey show that wired teens are more likely to buy things online like books, clothing and music than teens were in 2000. Thirty-one percent of today's teens are also turning to the Internet for health, diet and fitness information, and 17 percent of the high school set are getting information about drug use and sexual health information from the Web. If you want to see the Pew Center's complete findings, you can access the report on the PIAP Website.